Cash is used by all, young or old, rich or poor. It does not lead to discrimination as everyone uses the same notes and coins. Cash contributes to social cohesion and constitutes the ultimate social network. In 1875, British economist William Stanley Jevons1 demonstrated how money remedies the problem of the ‘double coincidence of wants’ which severely limits the bartering system: “The first difficulty in barter is to find two persons whose disposable possessions mutually suit each other’s wants. There may be many people wanting, and many possessing those things wanted; but to allow an act of barter, there must be a double coincidence, which will rarely happen.” In a barter economy, a transaction may occur when the supplier of goods A wants B and the supplier of goods B wants A. Money facilitates transactions as it provides more liquidity: the suppliers of goods A and B may sell to whoever and use the funds to purchase the product of their choice. The concept of double coincidence of wants could also be extended to payment instruments. For two parties to agree to transact, they both need access to the same payment instrument. And the instrument used most widely is cash. In fact, banknotes and coins have become a universal language. They enable people from different cultures and different societies to transact, to exchange goods and services and to communicate. Anywhere on the planet, the “meaning” of banknotes is understood, even between those who do not speak the same language. Within the broad cash community, there are active and even passionate sub-communities. An internet search for “banknote collectors” yields 528,000 results. Other cash geeks include communities who monitor the circulation of banknotes by tracking the serial numbers. 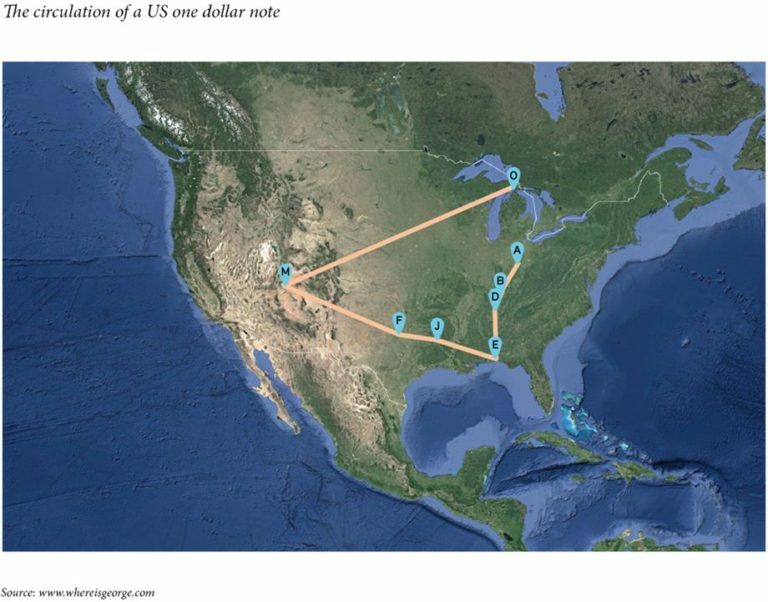 One popular site www.whereisgeorge.com follows US one dollar notes, which feature the portrait of George Washington. At the time of writing, the most popular note was spotted 15 times in just over three years, travelling 4,183 miles. Almost 250 million notes have been entered into the website. While this site was created essentially for fun, its data has been used by scientists to draw conclusions about the statistics of human travel, independent of the means of transportation involved2. These models are used, for instance, to predict the geographical spread of epidemics. Cash also helps to create a form of social cohesion within society. The same notes and coins are used by all, young or old, rich or poor. In a way, cash creates a social network. And this is an open social network that does not require detailed sign-ups or any form of technology. It is estimated that between 500 and 700 billion notes are in circulation around the world. According to the World Health Organisation4, in 2012, 89% of the world’s population had access to an improved drinking water source, compared with 76% in 1990; however, globally 1.8 billion people use a drinking water source that is contaminated leading to an estimated 500,000 deaths per year. As for electricity, the International Energy Agency World Energy Outlook5 shows that nearly 1.3 billion people are without access to electricity. Regarding information and communication technologies, the International Telecommunications Union6 estimates the penetration of fixed telephone subscriptions at 15.8 per 100 inhabitants and mobile-cellular subscriptions at 95.5% in 20147. The penetration of notes and coins is not measured, but it is likely that close to 100% of the population use banknotes at one stage or another. According to our estimates, there are between 500 and 700 billion notes in circulation around the world. This means that banknotes are probably the most-used product in the world. Depending on the conditions of circulation and the value of the banknote, its typical lifespan varies from one to five years. As a result, approximately 150 to 160 billion notes are printed every year to replace notes which are no longer fit for circulation and destroyed. The penetration of notes and coins is not measured, but it is likely that close to 100% of the population use banknotes at one stage or another. Because citizens come into contact with banknotes and coins every day, they see them as a symbol of national sovereignty. Money is a cultural instrument that conveys a message of unity for a political community. Banknotes circulate among large numbers of people and over vast geographical areas. As a result, they are often used to promote the country they represent and its values. Significant efforts go into a banknote design, involving experts in fields as diverse as history, sociology, psychology, and graphic arts to best reflect the country it represents. Banknotes tell a story about a country’s heritage. The design of the euro notes proved a particular challenge as they represent not one, but twelve countries when the euro was launched, 19 today and potentially more. Antti Heinonen, former Director of Banknotes at the European Central Bank recalls the process10: “Although most member states had a tradition of placing portraits of famous people on their currency, the banknote working group felt that this suffered the serious defect of an inevitable national bias.” One alternative was to display portraits of ordinary men and women across the ages, taken from European paintings and drawings. “The majority of the team feared, however, that it would be difficult to find pictures that would always remain nameless, that would be aesthetically pleasing and that would represent the genders and different nationalities in a balanced way. There was always the possibility that a portrait would be identified and associated with some region or country on the basis of its features, decoration style and location.” The winning design, created by Robert Kalina from the printing works of the Austrian Central Bank, features bridges, arches and gateways in different architectural styles. The design was then modified to ensure that these architectural features do not represent existing monuments. Besides picturing the country’s heritage and values, currency also plays a strategic role in economic terms: it provides a domestic payment system. There are numerous examples where payment cards are not accepted in a country due to political tensions. In Cuba for instance, credit cards issued by US banks are not accepted though this may evolve as diplomatic relations between the two countries improve. A currency also reflects the strength and various aspects of the economy. The international circulation of a currency illustrates the international or regional influence of the country. Lastly, numerous jobs depend on cash. The production, issue, distribution and sorting of notes and coins are all labour-intensive activities. For the unbanked, which represent half of the world population, access to cash is the first form of financial inclusion. Nearly half of all adults in the world are excluded from formal financial services; that is 2.5 billion persons11. The vast majority live in developing or emerging economies and can represent 90% of the population in some countries. Even in some advanced economies the number of unbanked can be as high as 20%. In the US, the Federal Deposit Insurance Corporation12 estimates that 7.7% of households were unbanked in 2013 and 20% were under-banked, meaning that they hold a bank account but do not have full access to banking services. According to the World Bank13, lack of money is the most frequently cited reason for not holding an account. Distance and documentation are also significant obstacles. Often, the main barrier to account penetration in rural areas is the large distance to a bank branch. Other barriers include stringent “Know Your Customer” regulations that banks are required to comply with as well as guidelines on combating money laundering and the financing of terrorism. These can prevent poor households from entering the financial system. Central banks and regulators have taken a variety of measures to foster financial inclusion14. Some countries, such as India, have encouraged the expansion of bank branches and ATM networks; the number of ATMs in India has been growing at a compound annual rate of 24% since 2010 and is expected to reach 175,000 in 2015. Many others, including Brazil, Colombia and Peru, have promoted “branchless banking” meaning the delivery of financial services outside of conventional bank branches. The third lever for increasing financial inclusion is innovation, as illustrated by the development of M-Pesa in East Africa. M-Pesa was launched in 2007 in Kenya. According to the Central Bank of Kenya 2014 Annual Report15, in June 2013 there were 120,781 mobile money agents, with M-Pesa accounting for 66.43%. This figure far exceeds the country’s 26,750 bank agents. Greater financial inclusion not only requires an increased network for depositing and withdrawing cash – bank branches, ATMs, micro-finance institutions – but also instruments to transfer cash faster and cheaper, including mobile devices. This increases the demand for cash and raises the velocity of banknote circulation. The Financial Sector Deepening Trust of Tanzania (FSDT) has completed a census of cash outlets in the country, where basic “cash in/cash out” transactions can be conducted16. M-Pesa agents number almost 17,000 and account for 87% of all cash outlets commonly used for financial services or money transfers. (Data on the agents of other mobile money systems was not available.) MFI (Micro-Finance Institution) branches are the second largest type of outlets, with almost 1,100 points across the country. Commercial banks have almost 500 branches and an additional 369 stand-alone ATMs. Traditional money transfers are made at over 400 bus stands and 200 post offices. Cash plays a key role in building a price reference. Cash is also an important educational tool. Many children around the globe do their first arithmetic by counting notes and coins. For economists, money is defined by three key functions: a medium of exchange, a store of value and a unit of account. As a unit of account, money serves to measure the value of goods and services. Cash plays a key role in building a price reference: banknotes and coins help to visualise a price expressed in abstract numbers. Banknotes and coins also contribute to the education of children. All over the world; children learn to count and solve arithmetic problems with banknotes and coins as their first steps in financial education. In many countries, central banks contribute to this effort; the Reserve Bank of India, for instance, has dedicated part of its website to a Financial Literacy Project17. The objective is to explain the role of the central bank and general banking concepts to various target groups including children and college students, women, defence personnel, senior citizens and the poor in both urban and rural areas. Numerous board games use facsimile banknotes which children spend to make their first transactions. Among them Monopoly is celebrating its 80th anniversary in 2015 by randomly replacing the facsimile notes with real notes for some lucky customers18. Pocket money is another form of financial literacy. By the age of three or four, most children understand that money can be used to buy things they want. Pocket money is a form of financial literacy. By the age of three or four, most children understand that money can be used to buy things. Banknotes are designed with art and symbols that represent their country. For many people, they constitute a cultural and historical experience. One of the most widely viewed portraits in the world is that of George Washington painted by Gilbert Stuart and reproduced on the US one dollar note19. From January 1999 to November 2008, the United States Mint ran the “50 States Quarters Program” and annually issued five commemorative quarters with designs emblematic of a state on the reverse. These coins educated millions about the history, culture and geography of each state. They encouraged a generation of Americans to examine the coins in their pocket and revived the hobby of coin collecting. The program also generated great public interest as millions of citizens participated in their state’s design-selection process or attended the launch of their state’s new quarter. Because coins are made in metals, they last for ages and provide clues about the place and period in which they were minted. Most written records from the ancient world have been lost or destroyed, but because coins are produced in large numbers, some survive where other evidence may not. Indeed, sometimes they are the only evidence that remains and provide important information for historians and archaeologists. ITU (International Telecommunication Union) is the United Nations specialised agency for information and communication technologies – ICTs. Currency, One Mode of Exchange among Others among the Yucuna Indians of Colombian Amazonia, by Laurent Fontaine, Journal des Anthropologues, 2002.